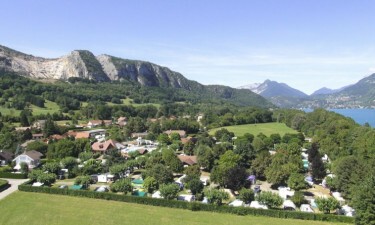 The mighty Mont Blanc forms a picturesque backdrop to this luxury camping site, while the enchanting Lake Annecy is situated less than a mile away. Anyone looking to take their time exploring will find the Alps and the surrounding area right on their doorstep. The beauty of La Ravoire is that it’s perfect for those who simply want to unwind during their camping holiday. Visitors don’t have to to leave the grounds if they prefer to stay, as everything they could possibly want is provided on the site. What Makes Camping La Ravoire So Special? An impressive swimming pool complex is situated in the very heart of La Ravoire and this is the ideal place for lovers of luxury camping to soak up the sun and have fun. The area surrounding the pool is set with sun loungers, which means that adults will be able to unwind in style and soak up the sun while the kids make use of the swimming pool and ride on the water slides. There are also plenty of other activities for kids of all ages to enjoy at La Ravoire. The LUX-camp comes complete with a large children play area, which is very colourful and features a slide, roundabout and other things to play on. 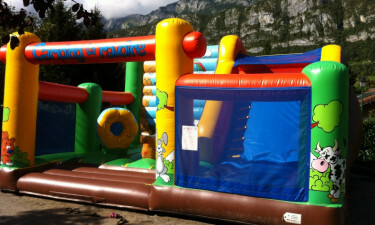 Younger children will be able to have fun on the bouncy castle, while the boules pitch is ideal for older children to play with their parents. The pretty town of Annecy is situated a little over ten miles from La Ravoire and families who hire bicycles on the site will be able to cycle there together in just a few minutes. A large lake is also a short stroll or bike ride away and this is a good place to take out a boat or spend a few hours fishing. One of the great things about this area is that no matter where people choose to go they will be greeted by pristine alpine views. The restaurant at La Ravoire is known for its freshly prepared French dishes and guests will be able to enjoy their meals on the terrace while soaking up the atmosphere. A wide range of special shows and other types of entertainment are held in the evening to make sure that there is never a dull moment for guests, while adults will be able to unwind in style by sipping locally produced wine at the onsite bar. Guests at La Ravoire who choose to rent a mobile home will find that it comes with everything they need to be very comfortable, including a stove. This allows guests to prepare their own meals if they choose and the onsite supermarket stocks an impressive selection of fresh and packaged products to choose from.